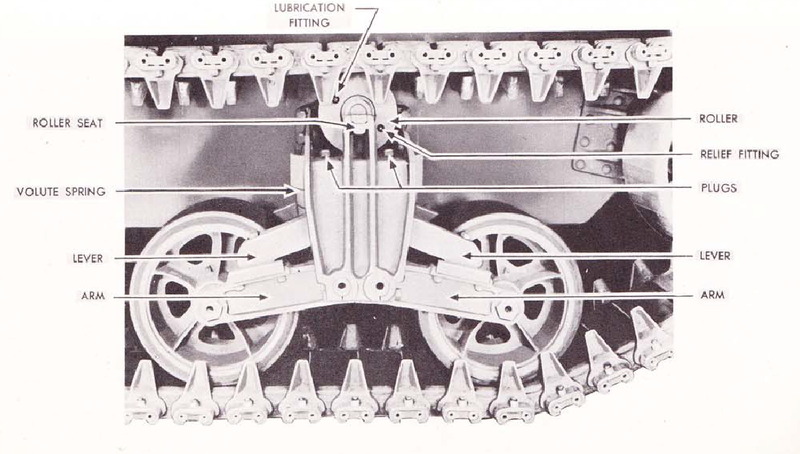 Vertical Volute Suspension: A very Good Suspension for a Tank that needs to Work. Early style VVSS, just about all Lees had this, and many early shermans had this suspension as well. 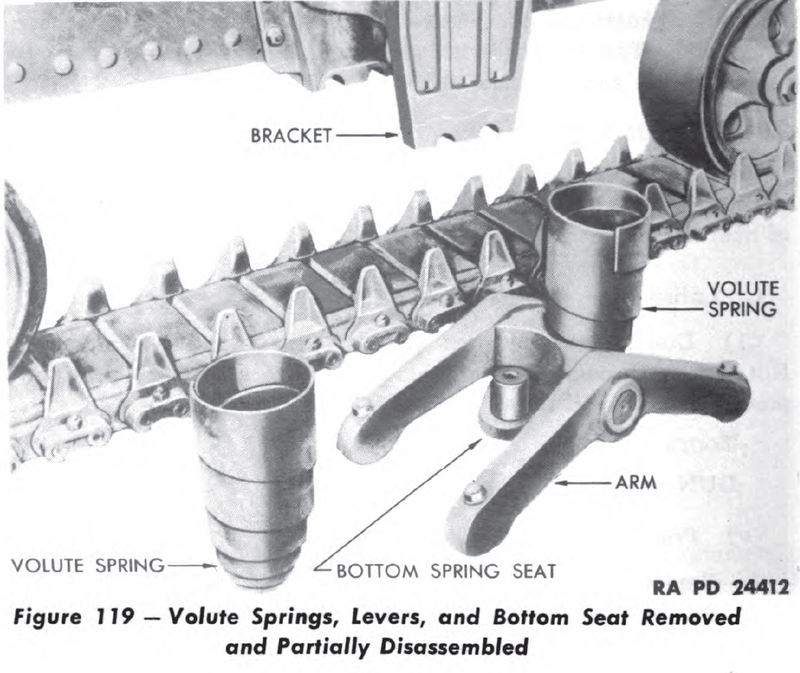 Springs tended to wear out, but they were not all that hard to replace. 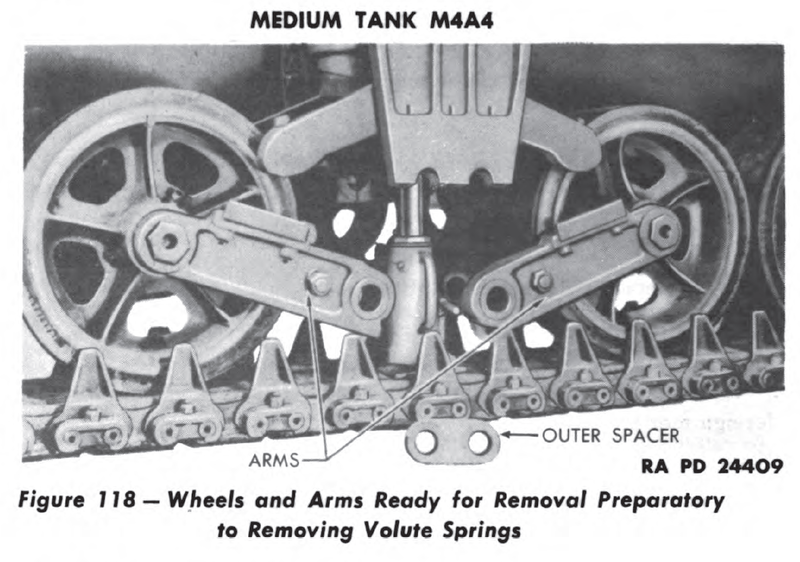 M4 tanks came with three main types of suspension the early VVSS with a roller on top, VVSS with a moveable roller bracket, and a skid, and HVSS, that used a wider track and changed the orientation of the volute springs. 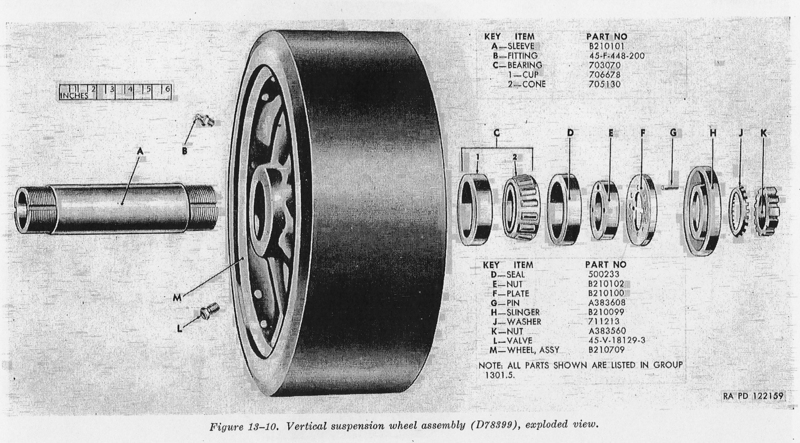 In the link above about Sherman details you can see all the changes the basic VVSS system went through. 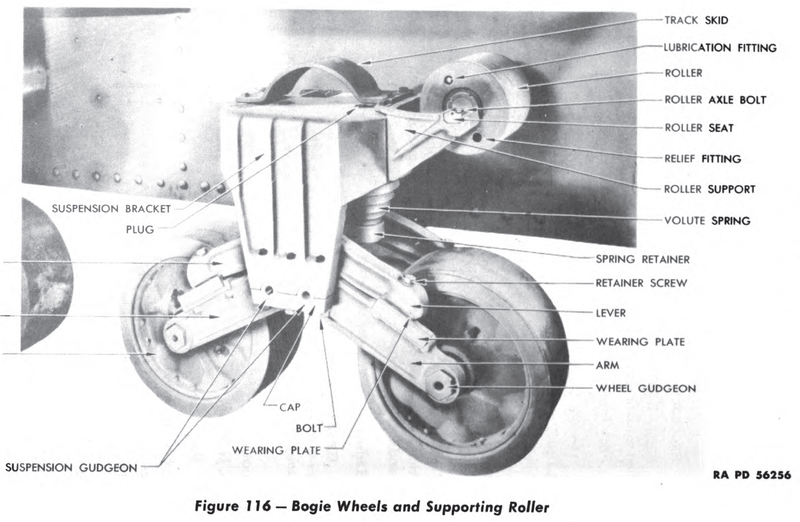 The VVSS suspension went from the basic two road wheel one return roller no support module as seen on the Lee, to the later production VVSS modules that had a bolt on return rollers, that could be bolted to either side of the suspension unit, and sheet steel track supports and much beefier structures that were still useable on either side of the hull. 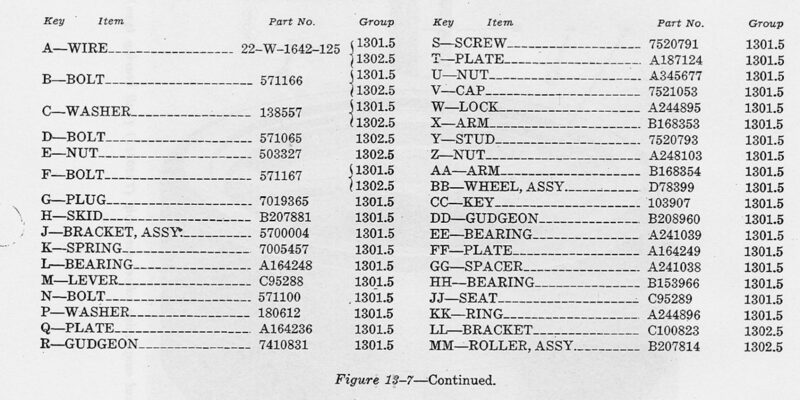 The suspension was one of the parts of the tank that went through so many minor changes, keeping track of them is out of the scope of what this document is meant to do. 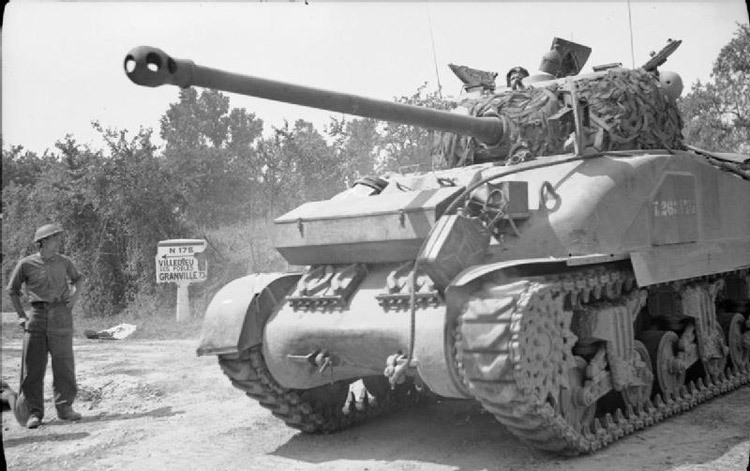 The Sherman Minutia site does a great job of covering these changes. 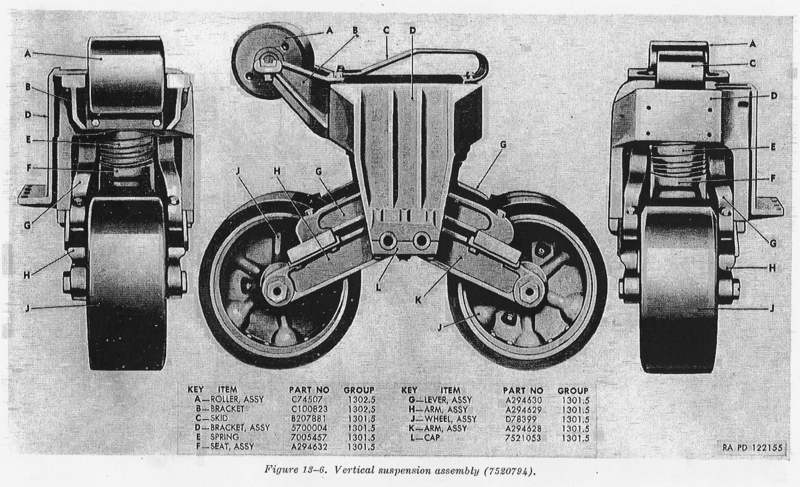 The changes had little effect on the performance of the tank; think of them more of fine tuning of the basic design for strength, longevity, and ease of manufacture, or changes needed to deal with tracks that used less rubber or were all steel. 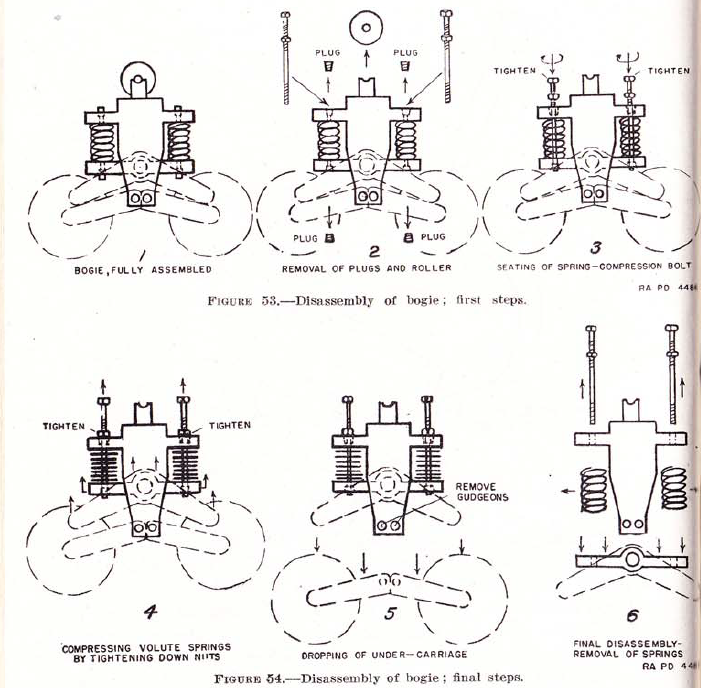 Before we go into a little more detail, we should cover what a volute spring it, and why it was used. 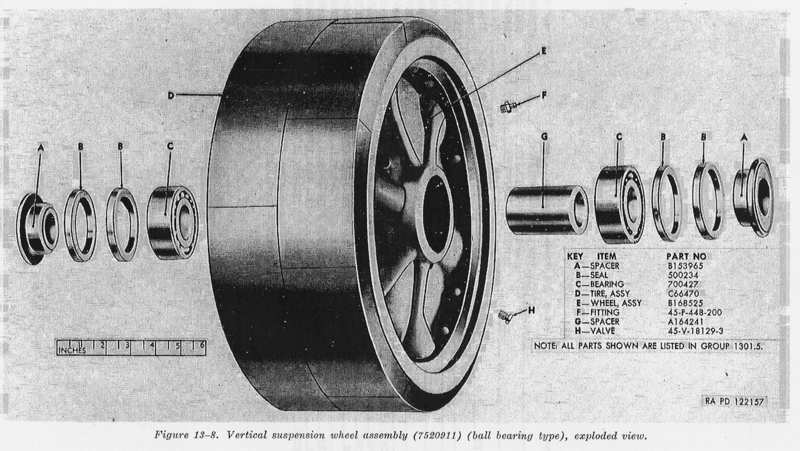 A volute spring is made from flat spring steel, twisted into cone shape. 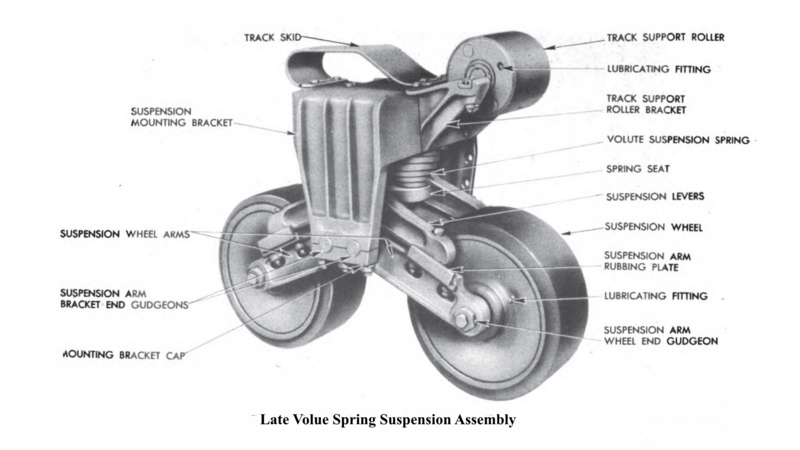 These springs can handle heavier loads, while compressing more, than a conventional coil spring. These springs are ideal for heavy applications like a tank. 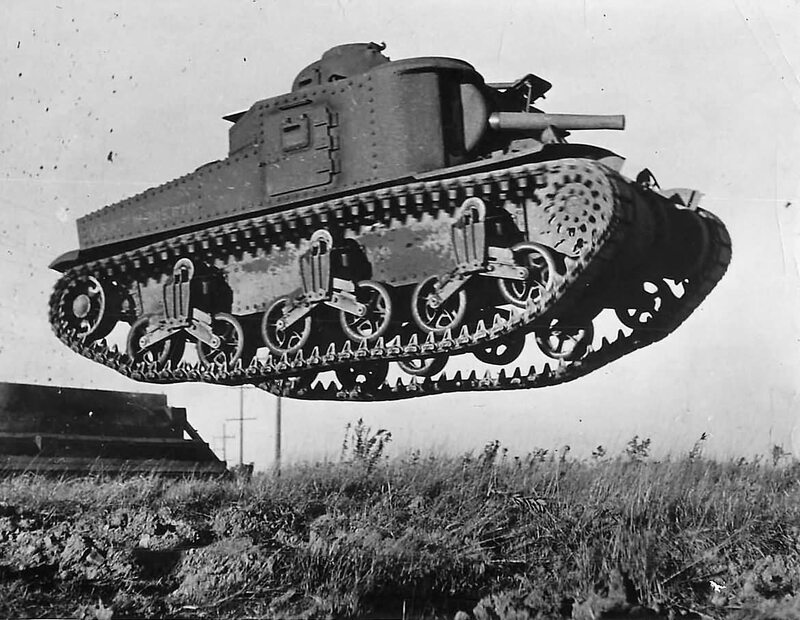 The Sherman used several strength springs before settling on a 9000 pound unit a fair time into the tanks production. I trying to find out the rate on the older springs, but no luck so far, the 9000 figure comes in from a document reader Whelm provided. 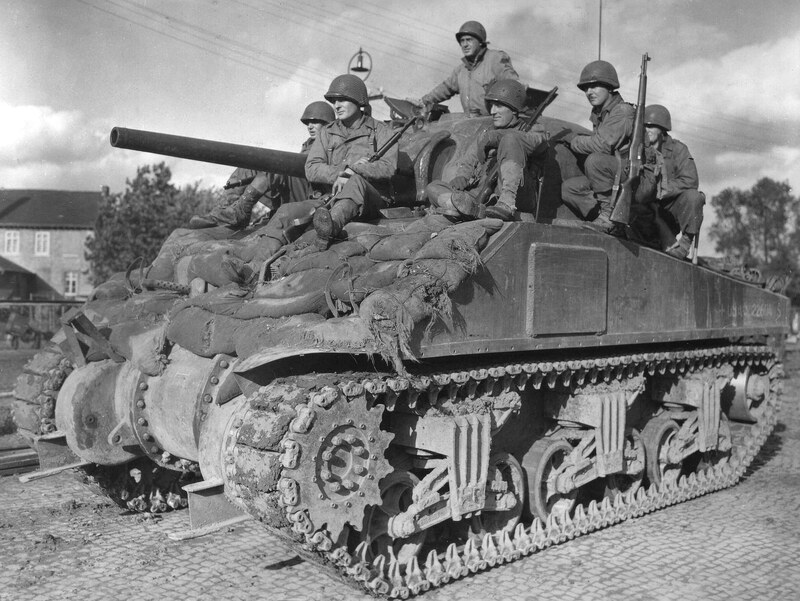 Early heavy duty VVSS found on DV M4A4 tanks. 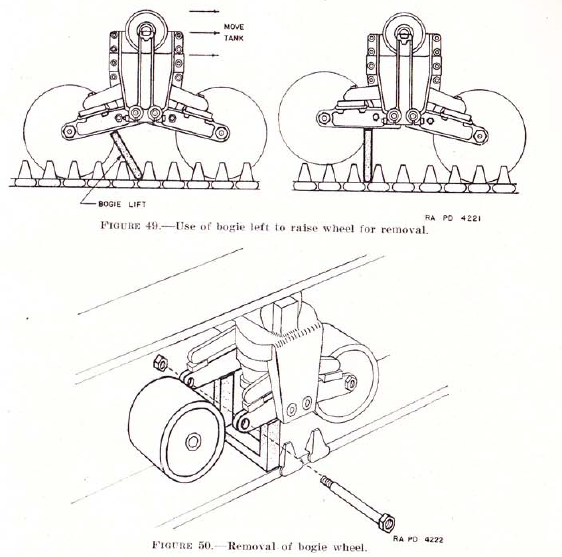 Not the smaller curved track skid, and the roller arm being flat. This is the ultimate or final production VVSS bogie. It has the heavy duty skid, upraised support arm with space to raise the roller up a little more. 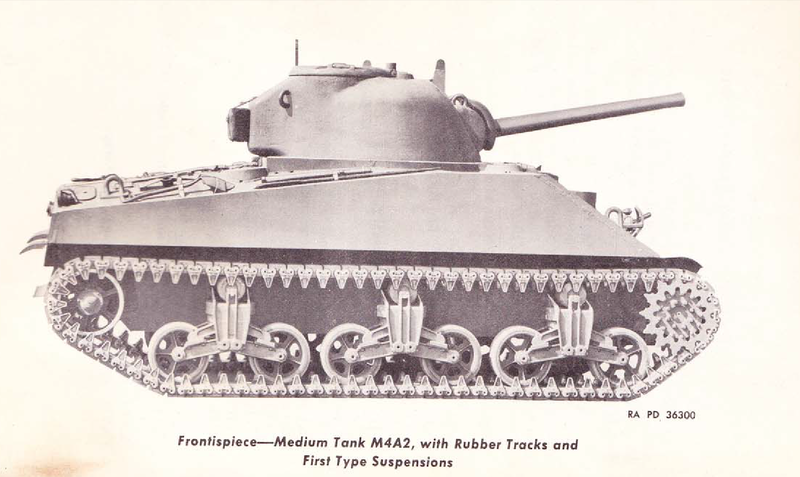 The final type of VVSS, with the return roller that could be swapped to either side, was developed for the M3A4 lee, with the A57 multibank motor. The combo of heavier hull and engine was putting the basic VVSS suspension with the built in return roller under to much stress and causing premature failures. 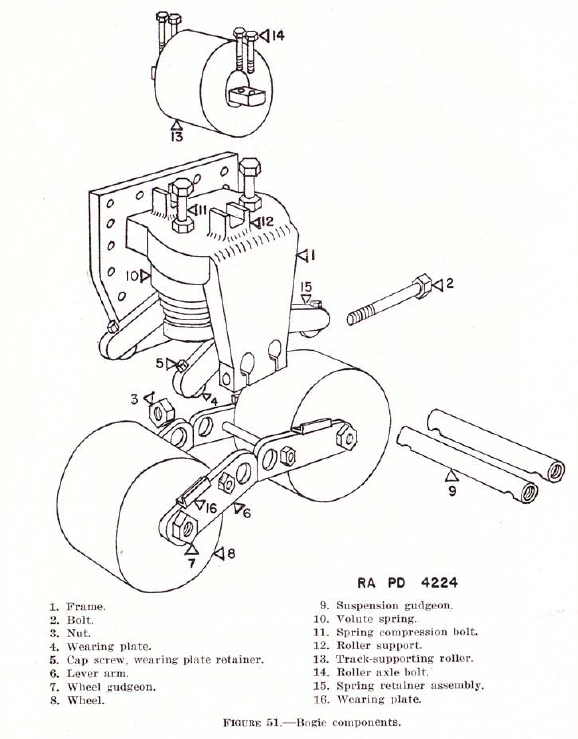 The heavy duty unit was developed to solve this problem and was standardized as the M4 suspension type, though, the bolt on roller and skids would still receive improvements, a beefier skid, and a spacer to lift the return roller, and later a new assembly that raised the return roller higher, the core remained the same. 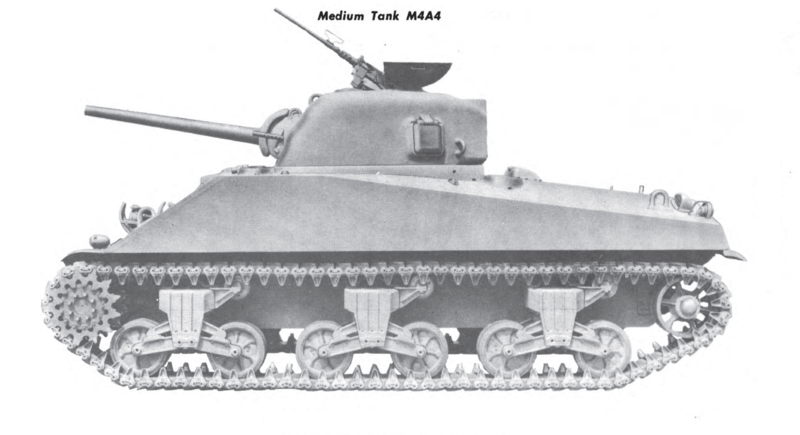 The M3A4 would be the only version of the Lee to receive the heavy duty VVSS suspension units from the factory. 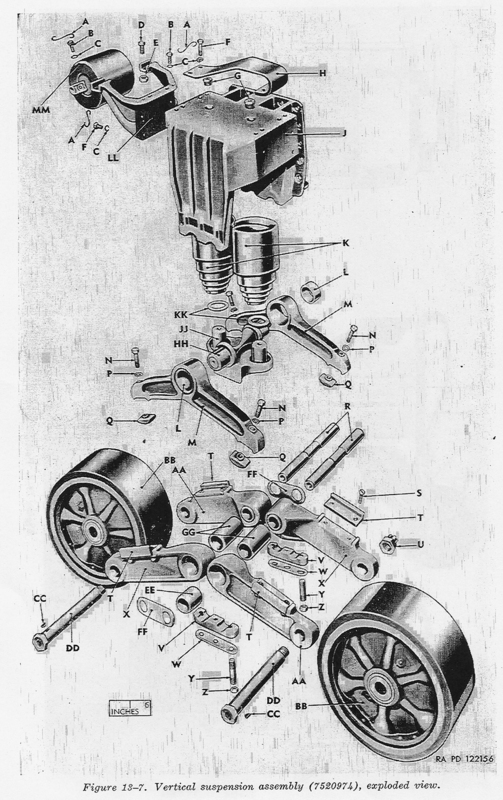 The advantages to this type of suspension system was ease off maintenance, ease of repair, and it was a fairly modular design, so the mounting points could be moved easily to accommodate other design needs. It was tough, and offered a fair ride, and good off road performance in dry to moderately wet terrain. 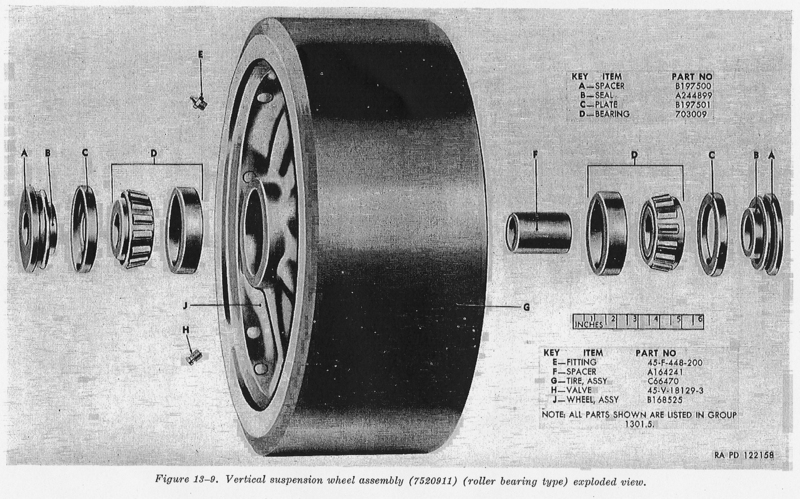 The main drawback to the VVSS was the narrow 16.56 inch wide track. It also didn’t articulate as much as the Christie and torsion bar systems, but took up no internal space in the hull like these types did. 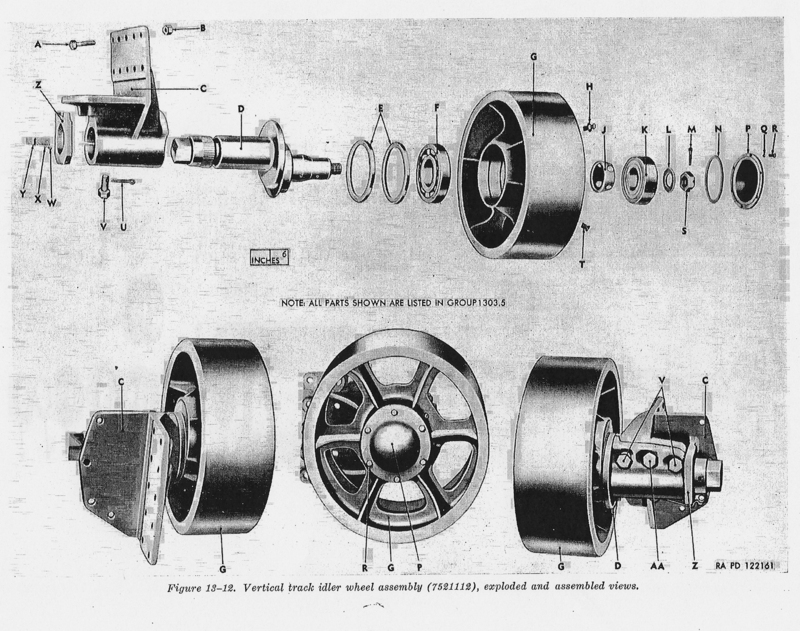 These images show the two types of stamped road wheel, they look the same but one used roller bearing, the other ball bearings.